CAUTION: READ AT OWN RISK. Sorry about the yelling, but I have to warn you. This isn’t a pretty post, especially if you’re like me and a daily flosser. I actually take pride in truthfully answering that infamous question you’re asked when you go to the dentist. “Do you floss every day?” Yes, I do! Then, I sit back and relax in the dentist’s chair while the hygienist flosses my teeth, knowing that she’ll soon see I’m telling the truth when there are no tender areas or blood specs. My gums are solid! They’re healthy and they can even withstand the hygienist’s tough flossing test! That is until today. It was a typical morning. I woke up, scanned the New York Times and read a few articles, then went into the bathroom to start my daily routine. I pulled out the Oral B and began to floss. But, what’s this? A sudden shooting pain in my neck. Huh? I stood a moment, waiting for the pain to subside, thinking it was one of those “crinks” you sometimes get. But the pain only increased. Wow, this hurts! 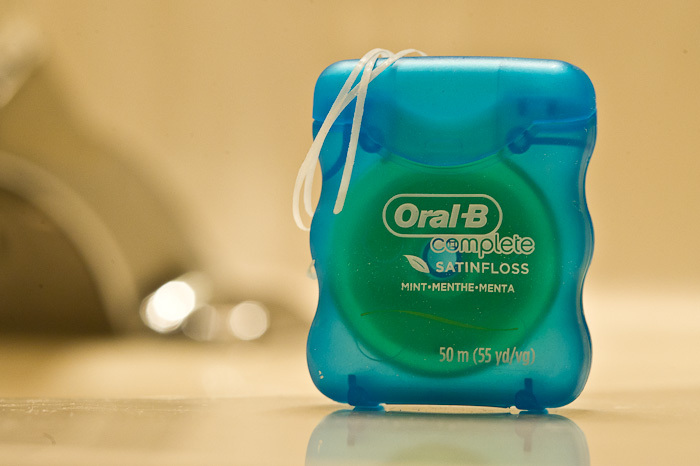 I dropped the floss on the counter and headed back to the bedroom, thinking I’d lie down for a minute until it eased. No such luck. Yeah, I would laugh, too, if someone told me this story. It’s almost too crazy to believe. So, I did call the doctor to make an appointment for tomorrow, and I look forward to adding a little humor to their day. At least I can take comfort in knowing that I’ve given someone another reason to skip flossing—it’s dangerous to your health! Tricia – that is scary! Please let us know if you are ok after you see the doctor! Ouch…maybe a trip to the chiropractor may be in order. Hope you are feeling better Tricia! You know, I’ve never used a chiropractor but this time it did cross my mind! I am feeling better today, thanks! Did you find out what was the cause of the sharp pain though? Many people let these signs pass by until the REAL monster comes out… and THAT’s when the hospitals make money! Do find out why and what happened. I would imagine bad posture while asleep. No definite cause, unfortunately. But it’s been a week now and it’s almost back to normal. I have tried different pillows and have found one that seems to feel better. I think you are correct and that the sleeping posture is an issue. Thanks for your input!